Do you ever wish that you could enter the Mediterranean coast but by stepping outside your door? Perhaps you have visited the Mediterranean on holiday. Or maybe you admire the Mediterranean from a far, combing through pictures on the internet. Either way, your outdoor living spaces can embody the rustic, natural design of Mediterranean romance and extravagance. The Mediterranean region is full of distinct countries, each with its own culture, beauty, lifestyle and natural charm. However, a few characteristics seem to illustrate the region as a whole. The Mediterranean aesthetic is known for its unique textures, calming colors and laid-back vibe. You can easily incorporate these elements into your design, transforming your outdoor space. I’ve put together a few design ideas that will help you feel as though you are relaxing along Italy’s coast without ever having to pack your bags! When I first think of the Mediterranean I am transformed to lovely little pebbles, intricately cut pavings, and textured roof tiles. I can’t help but think of the turquoise waters of Greece, the terracotta homes in Spain, or the Travertine marble clad Roman monuments. By design, the Mediterranean is unique. It’s not linear, simple lines, but almost seems to come to life through a more natural, flowing topography. Don’t be afraid to draw upon the ancient. A key characteristic of the Mediterranean region is its rich ancient history. You can draw inspiration from the medieval history that this area is known for. Column end tables or other vintage-looking pieces are a great place to start. Perhaps a stone coffee table to bring in an “ancient ruin” feel. Terra-cotta pavers or Spanish tiles are an excellent addition to enhance your Mediterranean outdoor living space. These simple elements will immediately transport you and your guests to the charming Mediterranean countryside. Consider including areas of gravel where you can add accents with potted plants and mosaic tiles along a wall that offers privacy from neighbors. You can also add thick columns around the pool or garden area to incorporate a bit of Rome’s most famous architecture into your design. To embody the Mediterranean vibe, you’ll want to incorporate wild plants and brightly hued flowers into your outdoor living space. Along the various Mediterranean coastlines, vibrantly colored tropical plants are abundant and they remain wild and untamed. While of course you’ll want to keep the greenery in your backyard orderly, adding large planters and vines will lend your space the same untamed look without the high maintenance. Consider wild Zoysia grass or Scaveola plants that will help you create an awe-inspiring oasis in your backyard. Plants are often secondary to the hard landscaping in a Mediterranean garden, but you do not have to ship in stone from abroad. There are plenty to choose from in Dubai to help you achieve that laid-back Mediterranean feel. For example, Travertine Marble natural finish for walls and floors, Terracota tiles for patios, stone cladding and brick claddings for dry-stone walling and riven stone slabs for paving, retaining walls and terraces. The result is spectacular! Pennisetum Rubrum grass and Cyperus grass make a great backbone for your Mediterranean-style border, not simply for their structure, but also for the sound and movement they achieve when the breeze blows through. Create a vibrant color palette of turquoises or blues to instantly lend your space a Mediterranean vibe. 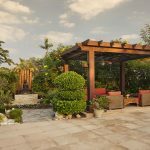 Warm tones can be applied throughout your entire outdoor living space or garden, or you can use them sparingly, for example, creating a walkway. Mix various shades of blue, but be sure to keep them within the same tone. If you desire something a little softer, use your favorite light shade of blue as the neutral instead. Turquoise looks marvelous with other neutral tones and adds tons of personality. You can even get creative by incorporating soft, purple lavenders, or rich mauve and lilac hues to add to your Mediterranean vibe. Water features are a must for any Mediterranean inspired garden. They are soothing while creating a touch of cool to the heat of the summer. The gleam of water adds a wonderful new dimension of your garden, while the trickle of shallow water reminds you of the calming sea. Whether in ornamental ponds or pools, or custom fountains and features, the sight and sounds of water always provide a wonderful relief that draws upon the laid-back Mediterranean lifestyle. By adding a few details and accents to your garden you can create a Mediterranean oasis right outside your door. You can easily incorporate various textures, calming colors, water features, and pathways to transform your space into the laid-back vibe area that embodies the Mediterranean. So for now, you can set your passport aside and enjoy the comforts of your backyard!